I’m so over the entire genre of cooperative games. I’ve seen too many of them fall into the same traps to ever have too much faith in them. This is not because of the “quarterback problem,” so called because one person can command everyone else around the table. I’ve always considered that to be an interpersonal problem more than one based on design. My real issue is that it’s tough to build a lot of variety into a game that relies on AI. It’s not that the games get easy, though that can be an issue. It’s that there’s an inherent sameness when dealing with an automated system. Even when it’s a challenge, you’ve seen it all before. This is a bigger problem with lighter co-ops like Pandemic, where the emphasis is more on strategy then on creating a strong narrative experience. The cooperative games that engage me most worry less about mechanical brilliance and more about a good story, where the issue is no longer whether the group wins but whether you had fun getting there. Robinson Crusoe does this more effectively than any cooperative I’ve ever played, and does it without sacrificing all of the strategic richness that thinkers will want. It’s the best cooperative game I’ve ever played. 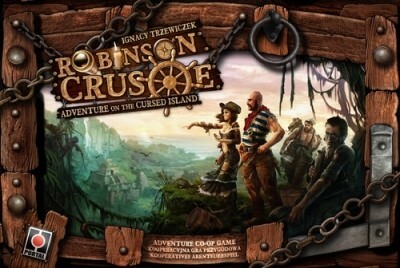 Robinson Crusoe isn’t so much about the titular character, but rather it’s a game where the players all take the role of castaways on an unexplored island. As a group you must secure a source of food, build a shelter and tools, deal with bad weather, hunt animals, and explore new regions on the island. Building anything requires different resources that the players must gather, but the island is a dangerous place. Each player gets two pawns, representing attention given to a task. You can make sure a task will get accomplished by using both pawns to do it, but you’ll often find yourself needing to split your time, which will require a roll of the dice for that task. You might fail, get hurt, or be forced to deal with some unforeseen consequence. The game comes with six scenarios, each of which presents a different goal for the castaways. You may have to save someone who was lost there, or escape from a tribe of bloodthirsty cannibals. One scenario casts the characters as a group of exorcists who must chase away the ghosts on the island by planting crosses all over the place. The scenario design is mighty impressive, since none of them are really that much more difficult to learn than any others. You could introduce one of the later scenarios to a new player, though it’ll take many tries before they could beat it. I’m not sure if you noticed, but I just described the game in mostly thematic terms. That’s impressive on two levels. First of all, this game generates a very detailed narrative. It’s actually easier to explain a session in purely story-based elements, and if someone knows how to play they’ll understand everything you said. Secondly, it’s impressive that the mechanics under the hood line up so well with what you’re actually doing. Because make no mistake, Robinson Crusoe is not just an adventure game. It’s no goof-off designed to appeal to theme-heads only. It’s a high-quality strategy game, expertly designed and filled with mechanical nuance. The heart of the game is the action system, and it’s basically worker-placement. You put your token in a spot and take the action associated with it. This is a shamefully overused mechanic, and when it’s done badly it can create a game that is mired in process and obsessed with turn order. But here, it feels like a revelation. There aren’t even turns to mess with. The group discusses where they will all place their pawns, and multiple pawns can be placed on the same action. It’s surprisingly open and smooth, and it means that the players spend most of their time actually doing what they want to do: cooperating. The game is also set up with an insane amount of variety right out of the box. I already mentioned the six scenarios, all of which are quite distinct. But the actual cards in the game will be wildly different each time. You only use a few event cards in any given game, and they have a drastic effect on your choices. There are also adventure cards that relate to specific tasks. Both types of cards play with the idea of consequences. Most of the adventure cards let you choose to do something cool now, but then might force you to deal with an extreme consequence later on. A player might suffer a wound that will get infected later in the game, or you might eventually be attacked by an animal that you chose not to hunt earlier. It serves the dual purpose of adding story and strategy, and I’ve never seen anything quite like it. There has been a movement towards hybrid design lately, and that’s mostly a good thing. But Robinson Crusoe bucks that trend by embracing European design elements, and re-purposing them to their maximum effect. Worker-placement actually makes more sense for this game than anything else I can think of, and of course a game about surviving a deserted island should be cooperative. It’s very much about making efficient actions, managing resources, and good planning. But the brilliance is that all of those things mesh so well with the idea of castaways on an island that I actually think making it a more story-based, random experience would detract from it. Robinson Crusoe is a difficult game, and not just in terms of winning. It has a surprising amount of detail in the rules. There are a half-dozen phases to each round, and specific things need to be done each time to keep the game functioning. Forgetting one could spin the game into too-easy or too-difficult territory in a hurry. And the rulebook isn’t always forthcoming when you need it to be. It gets the job done, but I’ve had difficulty finding different rules in a pinch. But again, the setting is so strong that it actually makes the game easy to learn. There hasn’t yet been a rule ambiguity that couldn’t be answered by assuming what would be the case in a real survival situation. And of course, winning the game is no easy task. The first time you try a given scenario, you’ll get buried. Try a second time, and you might do a little better. Keep trying, and you might just beat it. But it’s not going to be easy, and there are ways to amp up the difficulty if you need to. It also plays as a solitaire game, which seems appropriate given the subject matter. I’ve enjoyed it more with other people, but if you need a solo game you could do a lot worse, and not much better. And if you haven’t noticed, it’s a top-notch production. The illustrations and the board are both magnificent, and I especially like the way each person can choose to play a male or female version of their role. So the question is, will Robinson Crusoe stand where other cooperative games have faltered? Will it keep me engaged after numerous plays, still surprising me with the stories it generates? It’s obviously too soon to tell, but I really think it’s got the goods. After a half-dozen games, there are still facets that I’m discovering and new stories to enjoy. I’m amazed by its ability to present an engaging strategic experience while still engaging me on an emotional level. I guess I’d bought into the lie that worrying too much about mechanical brilliance can detract from theme. Robinson Crusoe shows that we don’t have to choose between the two.